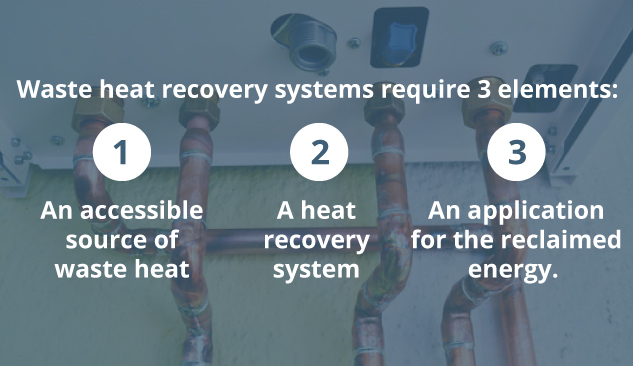 Home | Blog | What Is a Heat Recovery System? Over time, the energy needs of modern humans have become more varied and complex — transportation, manufacturing, refrigeration, communication, entertainment, residential and information processing are just a few examples of sectors undergoing tremendous change in this regard. Companies fulfill their energy needs with a variety of heat and power generating technologies that encompass both renewable and nonrenewable resources. 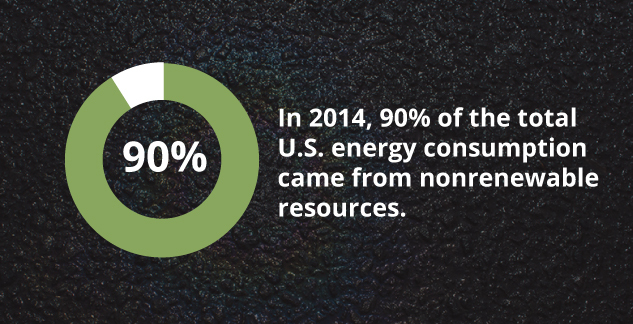 In 2014, 90% of the total U.S. energy consumption came from nonrenewable resources, according to the U.S Energy Information Administration. On a year-to-year basis, the cost of primary sources of energy, such as electricity, natural gas, and heating oil, can vary. However, energy prices tend to trend up over the long run, which presents a cause of concern for companies across all industries. In addition, the environmental impact associated with the use of energy sources has garnered considerable public attention from activists, academia, various levels of government, and private industries. Decision-makers have come under increased scrutiny to make intelligent policy decisions and capital investment outlays about the mix of energy sources and end-use technologies to improve the manner they procure and generate the energy required for their day-to-day operations. The pressure comes to lower total operating costs, create sustainable growth and reduce their carbon footprints. Industrial heat recovery systems offer effective, cost-efficient and environmentally-friendly solutions for achieving these objectives. Heat recovery refers to the process of reclaiming a portion of the energy wasted by the use of heating, venting, and air conditioning (HVAC) systems. The Laws of Thermodynamics and inherent inefficiencies in heat and power-generating systems restrict efficiency across various applications. As a result, a larger percentage of the energy you could otherwise use in your business processes and daily operations ends up dissipating in the form of waste heat. Heat recovery systems allow you to channel a portion of this energy and redirect it for reuse. You can use this redirected energy for applications that require both heating and cooling. As you conduct your due diligence to find out what the best heat recovery systems for your building are, you will discover that the various technologies have been available for a number of years. A convergence of technological advances, tighter budgets, and environmental concerns have made waste heat recovery a cost-effective and smart choice. Companies in nearly every industry operate in more holistic and integrated environments, which enable them to take advantage of internal processes to generate energy to help meet operational demands. Warehouses, manufacturing plants, office buildings, retail stores, and other industrial facilities all have something in common — they all have common sources of waste heat. Recovered and reused waste heat offers companies an emission-free substitute for costly purchased fuels or electricity. What Are the Best Heat Recovery Systems for a Building? Heat recovery systems can reclaim heat from outbound air as well as from different liquid systems. The heat recovery goals, needs, load demands, and energy requirements will vary according to the industry/facility. You will need to include these and other relevant factors to determine which industrial heat recovery systems you need to consider for your specific circumstances. Generally, the techniques used for accomplishing heat recovery involves the use of some type of heat exchange, which allows for greater efficiency by saving energy that would otherwise be lost. You can have heat recovery devices installed in ventilation systems, some boilers, hot water heaters, and other larger systems that generate large quantities of hot waste water. Waste heat recovery systems require three elements: an accessible source of waste heat, a heat recovery system, and an application for the reclaimed energy. Recuperators: Recuperators allow for heat exchange between the flue gases and the air that passes through ceramic or metallic walls. The system works by tubes or ducts, which allow for preheating the air and transferring it to the combustion chamber. The other side of the system contains the waste heat stream. Waste heat recovery boilers: Typically, this system consists of a standard water tube boiler that allows the hot exhaust gases from gas turbine incinerators to move over multiple parallel tubes filled with water. The water vaporizes in the tubes, collects in a steam drum and is utilized as heating or processed steam. Heat wheels: Appropriate for low- to medium-temperature waste heat recovery systems, heat wheels comprise a sizable porous disk. That sizable porous disk — manufactured from a material that has a fairly high heat capacity — slowly rotates between two side-by-side ducts. Hot air transfer moisture that contains latent heat is transferred to the disk and from the disk to the cold air. Shell and tube heat exchangers: This heat recovery system handles processes that produce a liquid vapor required to heat another liquid. This heat recovery system seals both paths, which contain the pressure of the respective fluids. Typical applications include process steam, distillation processes, bearings, lubricants, refrigeration, and air-conditioning systems, engines and air compressors. Economizers: This type of heat exchange unit preheats the boiler water feed for use with a boiler system. All industrial heat recovery systems require the use of a transport medium, such as water, refrigerant, glycol, desiccant media or air to exchange the energy between the source and the sinks or applications. The type of transport medium depends on the physical location of the waste heat source. The location will also affect the cost of the system. According to the U.S. Department of Energy, the industrial sector consumes almost one-third of the energy in the United States, and it also emits one-third of the greenhouse gas emissions caused by the burning of fossil fuel. Anywhere from 20 to 50 percent of the energy required for industrial operations results in heat losses in various forms, such as hot exhaust gases, heated products, hot equipment surfaces, and cooling water. These statistics underline the need for companies to take proactive measures to identify technologies that will reduce their carbon footprints and improve energy efficiency. Heat recovery systems can help accomplish this objective. In a time of increased emphasis on cost-cutting fuel conservation sustainability and environmental awareness, decision-makers have become increasingly aware of the issue of energy efficiency and protection of the environment, and they have taken the steps to modernize their facilities and processes. However, recycling and energy reduction is not enough. As industry leaders become more knowledgeable about the potential cost savings of wasted heat and its ability to generate a net increase in the energy yield, heat recovery has become an important topic in boardrooms. To implement a heat recovery initiative, management must consider the industry, energy form (electric, natural gas or heating oil), plant processes and operations, sources of waste heat and use or discharge of heat waste streams. Reducing energy costs: Each unit of recovered waste heat directly replaces each unit of purchased energy, which reduces energy costs. Reducing the cost of capital equipment: Reuse of waste heat results in the use of smaller energy conversion equipment, which reduces capital outlays and offsets the cost of heat recovery systems. The reduction in fuel consumption reduces flue gas generation and fosters a reduction in the size of equipment required to handle flue gases, such as fans, stacks, ducts, burners, etc. Lowering operating costs: Waste heat recovery reduces your energy cost and your total operating costs. Reducing environmental impact: Waste heat recovery reduces carbon emissions and your environmental impact on the air and water. 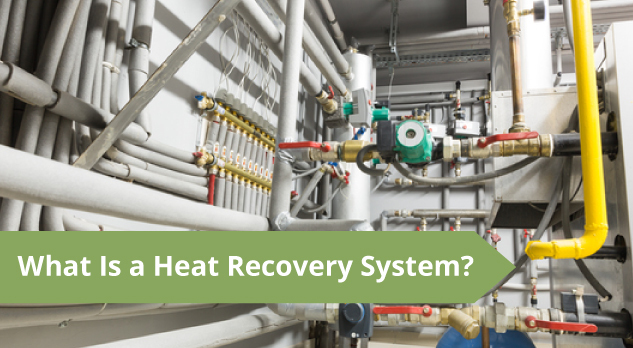 There are some challenges to implementing a heat recovery system. For example, some waste recovery equipment installations may not match the full recovery potential due to the material limits of the heat exchanger or the expense of extending recovery techniques to lower-temperature and higher-temperature systems. In addition, most unrecovered waste heat comes from low-temperature systems (below 450°F [232°C]), which has low thermal and economic value. 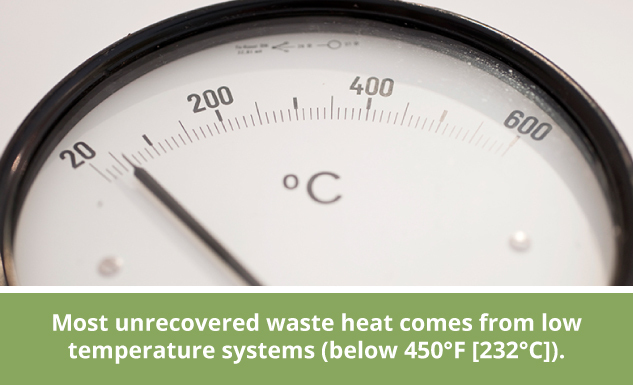 Nonetheless, the magnitude of low-temperature waste heat is hard to ignore, and it offers tremendous opportunities for waste heat recovery. In some industries, waste heat may be prohibited because of the source of chemical composition or because the recovery effort may not meet the required volume to be cost-effective. Waste heat recovery may offer your company a number of advantages. However, you must undertake the proper analysis to determine if it works for your situation. Conduct a code analysis: Heat recovery systems of certain sizes and outdoor air percentages will need to meet code requirements, such as the U.S. International Energy Conservation Code (IECC) 2012 and ASHRAE Standard 90.1-2010. These will have specific guidelines for energy recovery systems. On a case-by-case basis, systems must meet requirements such as minimum total energy recovery effectiveness, humidified spaces, dehumidification, and economizers (air and water). Perform an energy balance and source/sink assessment: The system designer must analyze the facility and process loads in order to align the waste heat sources with demands. Conduct a survey of your site to collect relevant data on your heating, cooling, boiling and condensation requirements, as well as the source of the heat waste. The load profiles will give you valuable insight into the available energy sources and sinks, and they will be invaluable in developing your feasibility study and calculating return on investment for the different heat recovery systems. Conduct a heat recovery system evaluation: Once you identify the potential energy sources and sinks, you can evaluate the different air recovery ventilation systems, HRV heating systems and other solutions for the extraction, transportation, and discharge of the energy. Make sure you also evaluate other relevant factors like the physical layout, system maintenance requirements, risk/uptime and cost-effectiveness associated with each solution. Include the building owner and facilities department: The successful implementation of a heat recovery system will require the “buy-in” of the owner and facility/maintenance manager for a successful project in both the short- and long-run. To compare the different systems, develop and weigh key performance indicators (KPIs), make sure you receive input from the other players. Examples of KPIs include risk, maintenance requirements, and ROI. The basic design and installation process should focus on the minimum energy consumption using the fewest heat exchange devices. The aim is to optimize the heat exchange network with a simplified design by making tradeoffs between physical efficiency and cost-effectiveness to achieve an optimal balance. Your heat recovery strategy must fit your industry and the specific processes of your business. It is important to work with an expert who can help you identify both waste heat sources and sink in close physical proximity for optimal conversion and minimal cost. If the physical location of the source and sink does not align closely, the design of your heat recovery system and processes will be critical for capitalizing on heat loss recovery and cost containment for installation and maintenance. Tuckey Mechanical Services Inc. and Tuckey Metal Fabricators Inc. both service innovative heat recovery systems to companies in the PA, MD and NJ region. If you would like a quote or would simply like to discuss your project, contact us today.